With a temperature range of -70°C to +150°C available and cooling capacities from 2kW up to 15kW @ -50°C, the CryoDax series of chiller systems can meet the most demanding requirements. Temperature stability of ±1.0°C is standard with tighter stability specifications available. The CryoDax series is powered by the state of the art, user friendly Opdax Controller which offers a microprocessor-based control system which incorporates ease of use for the operator with powerful controls. The Opdax controllers feature a menu driven system equipped with an interactive 5.7” color touch-screen display. System controls are exceptionally comprehensive and provide user input, along with built-in diagnostics and error messages. CryoDax standard items include a powder coated heavy-duty welded tubular steel frame with aluminum panels. Seal-less stainless steel pumps are utilized along with stainless steel brazed plate heat exchangers and a stainless steel turbine flowmeter on the Heat Transfer Fluid (HTF) return path. 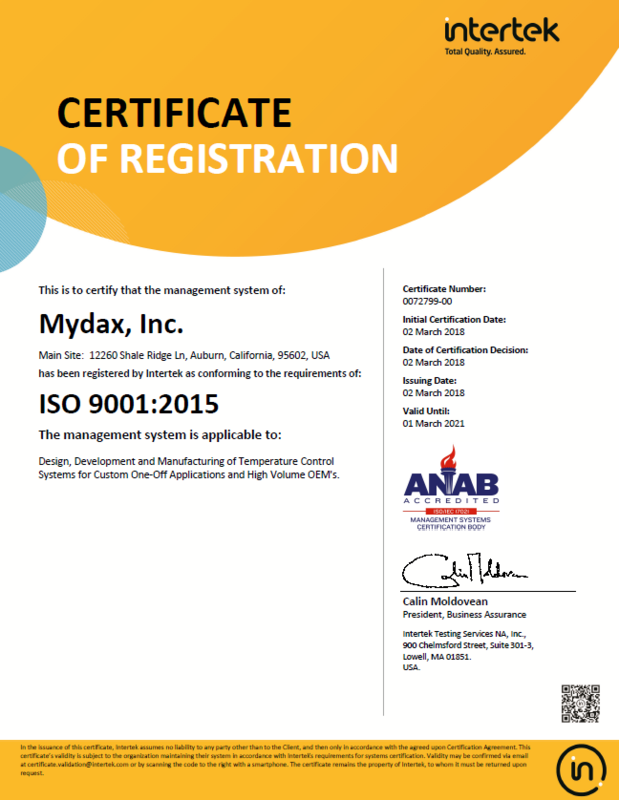 Strong, all brazed refrigeration and HTF copper piping and Mydax’s high reliability, patented proportional refrigeration technology is employed. RS-232 Serial communication interface and 12 Month warranty with free telephone and online support are also standard. Standard CryoDax systems are water-cooled, but air-cooled and/or outdoor rated versions are also available. CryoDax chiller systems are fully customizable to meet the requirements of your exact process needs. Some optional items include; Fluid filtration; Sealed reservoirs which includes provisions for a Nitrogen blanket on the fluid, pressure regulator and safety pressure relief valve; Variable Frequency Drive (VFD) to precisely meter the output HTF fluid flow; Stainless steel or other material HTF piping; Sound Insulation; Digital HTF Pressure Gauge(s); Modbus, GPIB (IEEE-488), RS-485, Ethernet LAN and Analog Input/Output; Special voltages and/or 50 Hz operation; Custom system design, frame size and form factor; Custom powder coat colors; Extended or onsite warranty; Remote temperature sensing and control; Custom software; SEMI-S2, UL or CE certification. Please call or visit Mydax online for more information.